Troy: city of gold, gatekeeper of the east, haven of the god-born and the lucky, a city destined to last a thousand years. But the Fates have other plans—the Fates, and a woman named Helen. In the shadow of Troy's gates, all must be reborn in the greatest war of the ancient world: slaves and queens, heroes and cowards, seers and kings . . . and these are their stories. Seven different authors penned this anthology, some of them am familiar with and others are new to me. This is only my second experience reading an anthology and I still wonder what the best approach is to writing up a review. A Song of War is divided into 7 Songs, do I go through each one individual making this review longer than usual or would a general overview (spoiler free) do this book justice? While I am fascinated with the time period, I've really only read about Paris and Helen. With A Song of War it's like getting the other side of the story from different points of view. Kate Quinn starts this book off with the first Song, called The Apple and clearly demonstrated why she is a favorite of mine. She knows how to grab the reader right from the beginning, she creates the characters of Hector, Andromache, Hellenus, Paris and Helen with unique personalities and I loved what transpired especially with Paris and Priam, it was original and totally plausible, not what I was expecting at all and it worked; I love when an author does that. Stephanie Thornton continues with The Prophecy and the story of Cassandra, someone I have never heard of before. Thornton likes to take unknown women of history and breathe life into their story, which is exactly what she has done here. I loved this chapter and I loved Cassandra, the misunderstood, frustrated daughter of Priam who can foresee 'truths no one wishes to hear'. Russell Whitfield takes on Agamemnon with The Sacrifice and I will admit to actually knowing nothing about him except that he is the brother of Menelaus. This Song opens with an emotional scene totally drawing my feelings for him in the opposite directions of what I anticipated. I saw what made him tick, Whitfield made be care and empathize about him. Christian Cameron is a new author to me and he continues with The Duel. Briseis, I love what I have read about her, a tragic past that has made her a slave in this war. This is one of the bigger Songs and one of my favorites. She had guts and determination I was anxious to read her story, I think I read it in one sitting, I couldn't help myself, she just drew me right in. Libbie Hawker is a new author to me, her Song, The Bow has me looking for her other works. Penthesilea, a Cimmerian, not really part of the Trojan Wars, is again another character I am unfamiliar with as was Philoctetes. I loved seeing the War unfold through the eyes of other, which was the case here. "He that fights fares no better than he that does not; coward and hero are held in equal honor, and death deals like measure to him who works and him who is idle." Vicky Alvear Shecter tackles the giant Odysseus in The Horse, what a job that was. She did it flawlessly, it was a pleasure to read. SJA Turney wrote with some of the same authors here as in A Year of Ravens, so I was looking forward to her Song, she doesn't disappoint. This was the perfect conclusion to an awesome book. My favorite, The Authors Note, was a fitting conclusion. This was just as entertaining as the book itself. I loved hearing from each of the authors with their thoughts and the tweaking necessary for all the pieces to fit nicely here. While I wasn't exactly sure what to expected with A Song of War, I got much more than anticipated and another book to add to my 'best of 2016'. Hats off to this great team, while written by 7 different individuals with 7 different writing styles this book flowed together perfectly, the transition from Songs seemed effortless. I loved this book, it was a pleasure to read. Thank you to Amy at HFVBT for the invite to be part of this tour and to Stephanie Thornton for a digital copy of A Song of Fire. LIBBIE HAWKER was born in Rexburg, Idaho and divided her childhood between Eastern Idaho's rural environs and the greater Seattle area. She presently lives in Seattle, but has also been a resident of Salt Lake City, Utah; Bellingham, Washington; and Tacoma, Washington. She loves to write about character and place, and is inspired by the bleak natural beauty of the Rocky Mountain region and by the fascinating history of the Puget Sound. After three years of trying to break into the publishing industry with her various books under two different pen names, Libbie finally turned her back on the mainstream publishing industry and embraced independent publishing. She now writes her self-published fiction full-time, and enjoys the fact that the writing career she always dreamed of having is fully under her own control. KATE QUINN is a native of southern California. She attended Boston University, where she earned a Bachelor's and Master's degree in Classical Voice. A lifelong history buff, she has written four novels in the Empress of Rome Saga, and two books in the Italian Renaissance detailing the early years of the infamous Borgia clan. All have been translated into multiple languages. 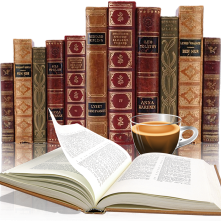 Kate has succumbed to the blogging bug, and keeps a blog filled with trivia, pet peeves, and interesting facts about historical fiction. She and her husband now live in Maryland with two black dogs named Caesar and Calpurnia, and her interests include opera, action movies, cooking, and the Boston Red Sox. VICKY ALVEAR SHECTER is the author of the young adult novel, Cleopatra's Moon (Arthur A. Levine Books/Scholastic, 2011), based on the life of Cleopatra's only daughter. She is also the author of two award-winning biographies for kids on Alexander the Great and Cleopatra. She is a docent at the Michael C. Carlos Museum of Antiquities at Emory University in Atlanta. The LA Times calls Cleopatra's Moon, "magical" and "impressive." Publisher's Weekly said it was "fascinating" and "highly memorable." The Wall Street Journal called it "absorbing." STEPHANIE THORNTON is a writer and history teacher who has been obsessed with infamous women from ancient history since she was twelve. She lives with her husband and daughter in Alaska, where she is at work on her next novel. Her novels, The Secret History: A Novel of Empress Theodora, Daughter of the Gods: A Novel of Ancient Egypt, The Tiger Queens: The Women of Genghis Khan, and The Conqueror's Wife: A Novel of Alexander the Great, tell the stories of history's forgotten women. SJA TURNEY lives with his wife, son and daughter, and two (close approximations of) dogs in rural North Yorkshire. Marius' Mules was his first full length novel. Being a fan of Roman history, SJA decided to combine his love of writing and love of the classical world. Marius' Mules was followed two years later by Interregnum - an attempt to create a new fantasy story still with a heavy flavour of Rome. These have been followed by numerous sequels, with three books in the fantasy 'Tales of the Empire' series and five in the bestselling 'Marius' Mules' one. 2013 has seen the first book in a 15th century trilogy - 'The Thief's Tale' - and will also witness several side projects seeing the light of day. RUSSELL WHITFIELD was born in Shepherds Bush in 1971. An only child, he was raised in Hounslow, West London, but has since escaped to Ham in Surrey. Gladiatrix was Russ's first novel, published in 2008 by Myrmidon Books. The sequel, Roma Victrix, continues the adventures Lysandra, the Spartan gladiatrix, and a third book, Imperatrix, sees Lysandra stepping out of the arena and onto the field of battle. 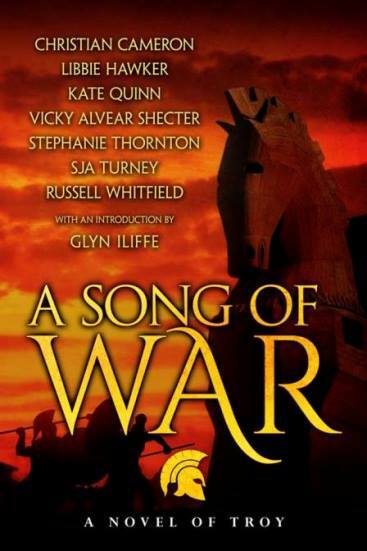 To win a paperback copy of A Song of War: A Novel of Troy by the H Team, please enter via the Gleam form below. Rules – Giveaway ends at 11:59pm EST on November 12th. You must be 18 or older to enter. – Giveaway is open to US & Canada residents only. – Only one entry per household. – All giveaway entrants agree to be honest and not cheat the systems; any suspect of fraud is decided upon by blog/site owner and the sponsor, and entrants may be disqualified at our discretion. – Winner has 48 hours to claim prize or new winner is chosen. Thank you for a WONDERFUL review! So glad you enjoyed ASoW.